A new Hollywood movie casts doubt on Cornwall's links to King Arthur by placing the legend of the ancient monarch in Cumbria. The film, which opens in the US on Wednesday, portrays him as a Roman soldier on Hadrian's Wall. 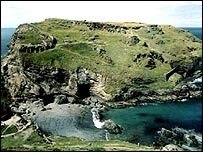 Tintagel in Cornwall has built much of its tourist industry on the popular belief it was King Arthur's birthplace. But the Cumbria Tourist Board says the evidence is "overwhelming" that his real home was there. Roger Toy, the head custodian of King Arthur's Great Halls in Tintagel said: "There are claims on the origins of King Arthur from all over the world so we are not claiming exclusivity to Arthur. "The main accounts of the legend say that King Arthur was born in Tintagel but the real message of the Arthurian legend is the message itself rather than the detail of who did what and when." And he said he did not think the film would have an adverse affect on visitor numbers. "I think the attraction of the legend is the story and there are so many places attached to that if it was going to have an affect on the tourist industry it would have happened long ago," he said. "I think people know of the Cornish connection already, once people's interest in the legend is rekindled or fired up for the first time they're going to want to explore all of the places associated with it." Cumbria Tourist Board advertises the areas claims on the Arthurian legend on its website. It quotes consultant historian John Matthews' theory that, geographically and historically, a Cumbrian Arthur works better than theories of his links to South West or Wales. He says early accounts of Arthur's battles against the Saxons can be fitted into the surrounding country on both sides of Hadrian's Wall and the presence of forts like Camboglanna and Avallana strengthen this argument. And Ken Campbell, from the Arthurian Society in Cumbria, said he thinks the film will attract more visitors to his area. "There are many places in Cumbria which have strong associations with the Arthurian story on both sides of the border," he said.